Synopsis: The comedy This Is The End follows six friends trapped in a house after a series of strange and catastrophic events devastate Los Angeles. As the world unravels outside, dwindling supplies and cabin fever threaten to tear apart the friendships inside. Eventually, they are forced to leave the house, facing their fate and the true meaning of friendship and redemption. In Hollywood they say that it’s not what you know, but who you know, and who you know can help you achieve success. Seth Rogen’s This Is The End is perhaps the greatest testament to that adage. Rather than construct a comedy with a few shocking cameos, Rogen turns his film into one big cameo, a who’s who among the actor/writer/director’s cohorts, and it’s all the better as a result. Rogen and co-director Evan Goldberg must have called in every outstanding Hollywood favor because This Is The End is packed full of director Judd Apatow regulars. Everyone from Paul Rudd to Jason Segal make an appearance, most for only a few minutes of on-screen time. Despite their fleeting nature, these rapid-fire cameos make for an opening act that’s packed with more jokes than most 90-minute features, and to be honest, could have sustained an entire film. 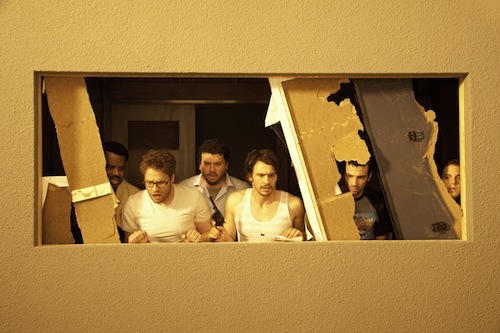 However, once the titular “end” kicks in, the film focuses on Jay Baruchel, Seth Rogen, Danny McBride, James Franco, Jonah Hill, and Craig Robinson. Not Baruchel’s or Rogen’s or McBride’s characters, mind you, but the actual actors. Well, not the actual actors, but exaggerated versions of their off-screen personas. For the most part this main cast is relegated to a single location, where they struggle to survive, oblivious to the death and destruction that’s right outside their door. It’s somewhat disappointing the film is more bottle episode than apocalyptic adventure, but that’s a tiny nitpick. This cast could make even the most mundane scenario entertaining. It should be mentioned that although the comedy has some broad appeal to it, if you aren’t a fan of Rogen be prepared for what is ostensibly, and quite literally, the Seth Rogen film to end all Seth Rogen films. That is by no means a slight towards Rogen, or Goldberg, who clearly know their way around a comedy script, just a warning. Aside from some general pandering to Rogen’s pot-smoking, phallus-obsessed fan base, This Is The End is the R-rated comedy audiences hope it will be, and then some. That’s because it doesn’t take its cast for granted, but uses every single famous face for at least one genuine laugh. The film’s first and third acts are certainly its strongest, but there’s plenty of humor to be found throughout. And the story’s not just a series of funny set-ups and punch lines either, but a clever play on the apocalypse. This Is The End is wholly original, genuinely hilarious, and occasionally heartfelt, and it will have audiences laughing loud and often. Although a lot of it exists in the periphery of This Is The End, the film’s production design is one of its greatest strengths. As you would hope, the film perfectly nails an apocalyptic atmosphere. When the film does choose to take the camera into the middle of the apocalypse, though, there’s an attention to detail to the set design that helps give the film a distinct personality. The creature designs in the film deserve special recognition because they don’t look like every other generic demon. There’s also a Ray Harryhausen-inspired aesthetic to them, even if they aren’t actually claymation. You wouldn’t believe it was truly “the end” if not for the production design, and while it isn’t in the limelight all that long, the apocalypse is well represented. 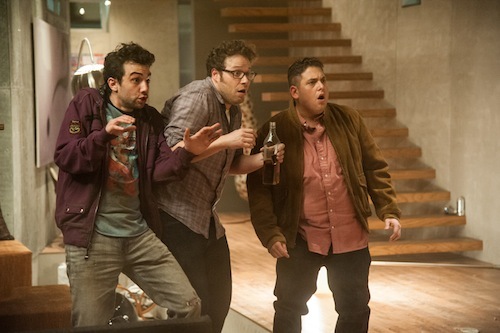 This Is The End is easily one of the funniest movies you will see all year, but be warned it is for a mature audience. It earns its R-rating within the first few minutes, and only gets more raunchy, crude, and borderline insane from there. As was mentioned earlier, the film loses some momentum in the second act, but by shifting to a more character-focused story it allows each comedic actor to shine. Clearly, Rogen and Goldberg have worked with these guys long enough to know where their strengths lie, and how best to use them. As well, these actors are comfortable enough with each other that they know how to get the best out of any scene. Occasionally the improv, off-the-cuff nature of the conversations gets a little long in the tooth, but there’s usually a nice reprieve – a big laugh out loud moment – right around the corner. Even in those rare lulls the film will have you chuckling, or at the very least smiling, and when it goes in for the big laugh it nails it more often than not.